We're going to try this again as the polar vortex got to us on January 30 and we had to postpone our event. 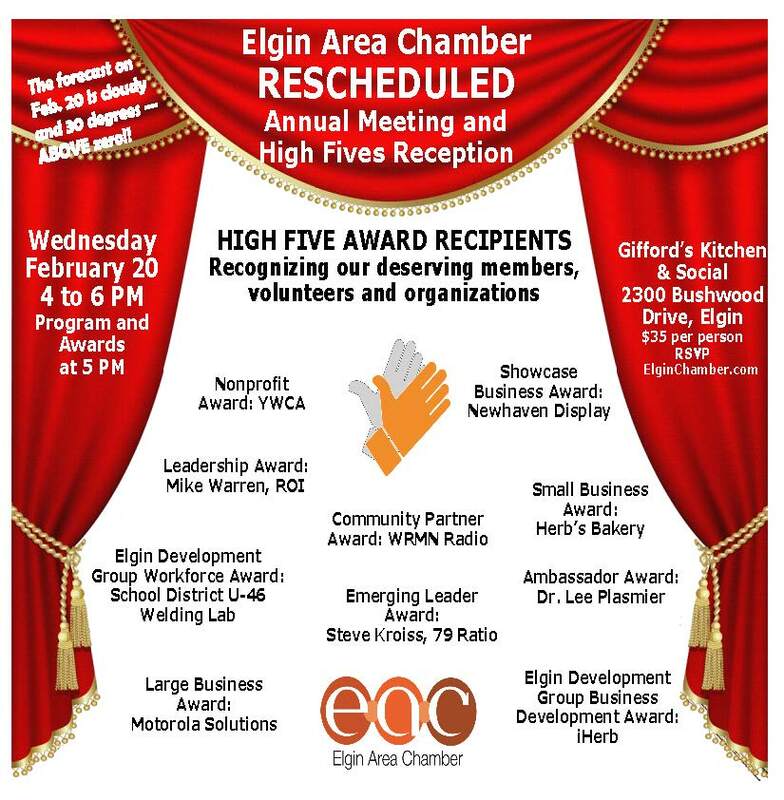 The Elgin Area Chamber’s 2018 Annual Meeting and High Five Awards Ceremony takes place on Wednesday, February 20 at Gifford’s Kitchen & Social, 2300 Bushwood Drive, from 4 to 6:00 p.m. The weather forecast on February 20 is cloudy and a high of 30 degrees -- that's above zero this time! Join us as we have again combined the glitz and pageantry of our High Five Awards with our 111th Annual Meeting into one high flying and fun reception. The event begins at 4 p.m. with networking until 5 p.m. followed by our program. This brief program features the formal installation of our board members: Nancy Abuali, Radius International, Ian Lamp, Lamp Construction, and Michael Wong, SmithAmundson. Tickets for the event are $35 each and includes hors d'oeurves and complimentary drink ticket. Reserve your tickets in advance on our website at ElginChamber.com. Thank you to our event sponsors Brittain's Car Wash, Rauschenberger Financial Advisors and Gifford's Kitchen & Social. 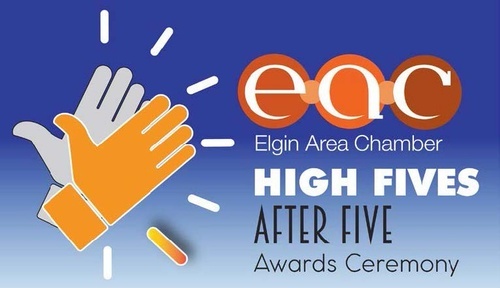 We hope you will make a resolution to join us on Febrary 20 and give us a High Five for a great new year with the Elgin Area Chamber! Reservations canceled 48 hours or more before the event will be refunded. Wednesday, February 20 from 4:00-6:00 p.m. Guests will enjoy networking from 4:00 until 5:00 p.m. as well as light appetizers, wine and beer. Our brief program begins at 5:00 p.m. featuring a tribute highlighting the evening's honorees followed by the formal presentation of the awards. Reservations canceled 48 hours or more before the event will be refunded.